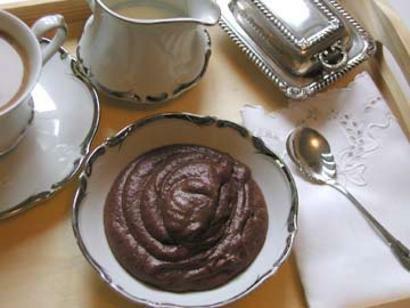 If you're making our Mousse at home, try a bowl after you've had it in the freezer for an hour or so. Frozen, it's like ice cream. This recipe was three years in the making. I just couldn't find the right ingredients for a creamy, chocolatey rich, subtley sweet, utterly perfect mousse that was 100% organic and instant. I wanted a mix that you could take camping, add some snow if it was winter and feel like you were dining in a five star restaurant. At last, here it is. If you're making our Mousse at home, try a bowl after you've had it in the freezer for an hour or so. Frozen, it's like ice cream. If you're a chocolate fan, this indulgence is a must. Organic Cane Crystals, Organic Non-Fat Dry Milk (Grade A, Low Heat), Organic Rice Starch, and Organic Non-Alkaline Cocoa.